Many, if not most, keep quails for their lovely eggs. Below you will find the information you need to get your very own adorable quail chicks. Unlike chickens, who typically lay in the morning, quails lay eggs in the afternoon or evening. It is not uncommon to get eggs at 8pm. They usually lay everyday, but some quails may skip a few days. Each year, they will go through a molt. We've observed that they molt twice a year, at the beginning of spring, and at the end of fall. They shed their extra feathers before the warm weather, and in the fall they regrow warmer, more waterproof feathers. During this time, they will often decrease their laying, or sometimes stop altogether. This can last for up to a month. Do not be alarmed if your quails suddenly have bare chests or backs, it will grow back soon enough. Quail eggs can be collected up to 10 days before incubating, however it is better to not go over 7 days. While they are waiting to be placed in the incubator, they must be stored at a temperature ideally between 13-15 degrees Celsius, but can go up to 17°C, though you will need to place them in the incubator more quickly. Do not place them in the fridge, otherwise they will no longer be viable. Do not wash eggs! It removes the protective antibacterial coating the eggs naturally have. If they are covered in poop, just don’t use them if possible, otherwise wipe it off without pressing too hard (to not get it in the egg shell’s pores). Quail eggs take between 16-18 days to hatch. If you put your eggs in the incubator at 7pm, your day 18 will start at 7pm on that day. Using the flashlight from my phone, I can see the embryo after 5 days, sometimes 3 if the shell is a lighter colour. At 3 days, the embryo is just a dot with a beating heart. It is an amazing feeling to see the minuscule heart beating through the shell. It is about the same size as the pointy part of a needle. I’ve only seen it twice out of many many eggs incubated, so don’t feel bad if you don’t see it. At 5 days, there will be visible veins, and a darker blob (if it isn’t hidden by spots on the egg). I can always see the embryo by day 5, but if I don’t see anything, I keep it until day 7 just in case. Online, there are many people who say that they cannot see the veins until quite later in the process, or sometimes never, they will just eventually see the chick filling the egg, so do not throw the eggs out until you are used to what you are looking for. Your light needs to be very bright. This process is called candling the egg. You place the egg on the light and can see through it. This process is also used for commercial eggs, even if not fertilized, to check the air bubble for size and placement. The larger the air bubble, the older the egg (but this can be sped up by heating it, which it is when incubating). It becomes larger by evaporating moisture into the air. The eggs will lose about 12% of their body weight from the beginning of the incubation to the end. If the chick dies in the shell after the veins are visible, the veins will fade in about 24 hours. In some cases, you can still see the veins, but they are much thinner than normal because they are no longer filled with blood. If you look at the membrane of an egg that has hatched, you will see these thin veins. That is what you are seeing. The veins of a living chick inside the shell are much thicker. During days 1-14, I keep my humidity levels between 45-50%, and during days 14-18, I increase it to 60-65%. The increase in humidity is to make sure that they don't dry out in their shell. If they dry too much, their membrane will shrink around them and cause them to suffocate, but if the humidity is too high, they can drown in their shell. If you are only incubating a few eggs, increase humidity to 50% at the start. When there are many eggs, they can make their own humidity from the evaporation and keep it more constant, but with only a few, it can drop faster and you might not notice if it’s during the night. From days 1-14, it is important that the eggs are turned at least 4 times a day, but more is better. It makes sure that they don't stick to the sides and that the liquid circulates to give them access to more nutrients. From days 14-18, lay them flat and do not turn them. They need to position themselves for optimal hatching. Often times, the last few days before hatching, the hen will barely move, sometimes not even going out to eat or poop. When almost ready to hatch, they will break through their air bubble membrane (if you candle the egg, you will see a beak pressed against the shell). This is when they start breathing the air in the air bubble. They will later crack the shell (called pipping). When they crack the shell all around, this is called 'unzipping'. It can take many hours for a chick to hatch after pipping, sometimes up to 24 hours. When quails and chickens hatch, they often have curled up toes. This goes away within about 24 hours. If it is not completely gone in 24 hours, it is always almost gone, with maybe a few toes slightly crooked, but they straighten out by the next day. I've never had any stay curled, they all have straight toes quite quickly, and I have hatched many chicks. They are curled because of the way their feet are placed inside the egg shell. 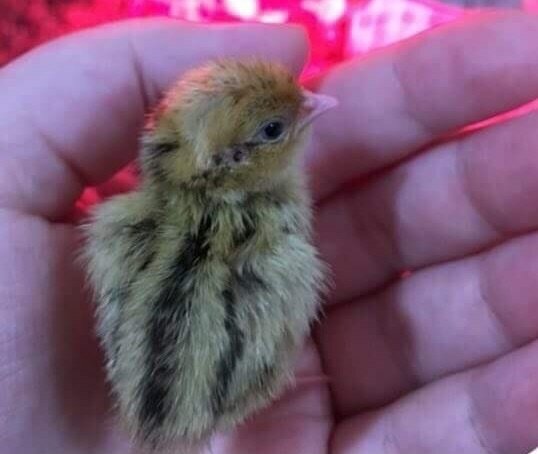 When quail chicks are born, the first few hours they usually just try to sit and sleep (you may not see this step if they hatched overnight). They will then start sort of "walk-sitting", where they walk, but with their legs bent in a sitting position. Basically the quail equivalent of crawling. By the next day, they are usually all walking normally. To have healthy chicks, read the feeding section in the quail menu. Although many people say that Cortunix quails have lost their broody and nesting instincts, we have found that this is not the case, as have a few others. Cortunix quails have simply lost their natural environment to feel free to raise their chicks. Most breeders keep these birds in small wire cages, where they have neither the space or cover to create their nests. 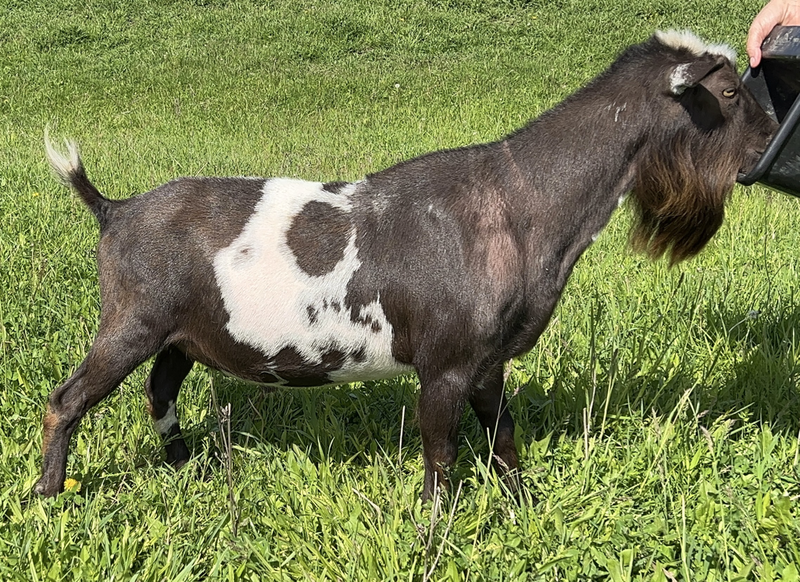 If allowed a very large space with hay, plant cover, leaves, dirt, etc., they will sometimes become broody. When broody, quails lose some feathers in the chest area, like chickens, to allow skin to egg contact. Since feathers provide insulation, the eggs would never get warm enough if she didn't lose any feathers. The amount depends on the female, but a bald patch isn't abnormal. However, when broody, they usually have a few feathers (enough to make them appear normal when walking), but if you spread those away, they have nothing under. Quails that are about to become broody usually act very stressed for up to two weeks before deciding to sit on the eggs. We have noticed that she will start off walking constantly along the edge of the cage, then start being interested in the eggs (rolling them a bit, being near them), then during the few days before becoming broody, she will start attacking our male quail. She wants absolutely nothing to do with him, and will chase him away if he is just in her line of sight. At this point, she started sitting on her eggs. Each time she would see our male, she would make a specific angry sound (one that I've never heard before having a broody quail), and usually the male runs away at this point. If he doesn't, she will leave the nest to chase him away. We ended up placing the nest outside of the main coop because our male became very stressed, and so did the other hens because the broody quail wanted to be completely alone. The broody quail could still hear the other quails, but she now had her own space. We used a cardboard box filled with leaves, sand, and hay. The sand heats up under the female's body heat, and will help keep the eggs warm when she is off to eat, drink, and dust bath. When our quail first became broody, it was when we had allowed them free range of our garage (20ft x 20ft for 10 quails at that time). This is a huge amount of space. Previously, when our quails were kept in a coop with 2.5 sq.ft. per quail, we occasionally had quails seem as though they wanted to brood eggs (they kept rolling the eggs in a small nest), but they stopped after a few days, even though they had cover and plants. In the few studies done on broody quails, they gave the female quail almost 200sq.ft for only herself and one male quail. In two studies, they ended up having to remove the male quail because he was getting attacked by the female. This shows that the quails really need a huge amount of space to feel comfortable raising chicks. While our quail was broody, the other hens were very helpful. Almost each time the broody hen left the nest, one or more other hens would come and sit on the eggs for her. They would run away as soon as the broody hen came back, because otherwise she would chase them out, but they still continued doing this everyday. Sometimes the broody hen would let them stay, and we occasionally had 2 or 3 hens in the same nest. Those other hens were not broody, they would spend the rest of the day acting normally, and only came to the nest when they saw it was empty. At first, those hens seemed quite awkward on the eggs. They didn't have the "broody posture" (I call it the pancake hen - the hen will lay flat with her wings somewhat curled to make sure all the eggs are hidden), but they eventually were better at keeping all the eggs under them. The other hens also made sure the eggs were safe. The broody quail didn't mind me checking her eggs from under her, but her friends did. I usually tried to check them when she was off the nest as to not disturb her, but I often got pecked from a few other hens who wanted to protect the nest. They would also sometimes block me. My quails normally do not act this way, they normally let me pet them (and they still did when away from the nest), so it was clear that it was because of the broody hen. They've never cared if I take their eggs, but they did care if I took the eggs from the broody hen. Clearly, they knew those eggs were special. Like chickens, broody quails must leave the nest to eat, drink, and poop. With chickens, they usually only leave the nest once a day, but my broody quail left much more often. Usually 2-4 times a day. I always give my broody chickens/quail a treat mix that is high in protein, because since they eat much less than normal, I want to make sure they don't lose too much weight. They will eat around 80% less than normal, at least for chickens. Our broody quail had a much bigger appetite that my broody chickens do, and would often leave the nest to run to me for treats. Broody hens have extremely smelly poop, and it is much larger than normal. It will be 2-3 times the size of their regular poops, sometimes more. It will often be more "log shaped". This is normal because they will be pooping only once or twice a day, instead of the many times they usually do. It will go back to normal a few days after her chicks hatch. Two days before the chicks hatched, every quail wanted to be very close to the nest and observe. The broody hen allowed most of the females to stay near her, but still refused the male. However, even our male really wanted to look at the nest. He would hide behind different objects to watch the nest without her seeing him, and whenever I sat beside our broody quail, he would hide behind my leg with only his head sticking out. It was very comical to watch, and I was surprised that they seemed to know the "due date" for the chicks. When the chicks hatched, the quail seemed very surprised and stressed. She would keep turning in circles in her nest and making a "cluck cluck" sound (kinda like the one chickens use to call their chicks), and would keep trying to take hay to hide herself. She wanted to be completely covered. We helped her with this, because the hay and leaves kept slipping off her back, and she calmed down a bit. She stayed this way for about 36 hours. After this, she started walking with her chicks and showing them where to eat and drink. She would also often walk with her chicks under her wings. The chicks would stay in there even while she was moving. I've never seen chickens do this, so I was very surprised and slightly worried at first. The chicks were completely fine, but it was scary to come in the first time and see no chicks, lift the hen, still no chicks, then suddenly a chick come out from her wings. Sometimes they would fall out, but most of the time they stayed in place. She was even able to bring her chicks over a barrier too high for the chicks to do it themselves by keeping them in her wings. I don't know if this is typical quail behaviour or not, because there is so little information on broody quails. With quail chicks, it is very important to keep them separate from the older quails (other than their broody mother). This quail ended up hatching two batches of eggs because the first one got squished by the other hens. Quails often step on each other instead of walking around, and we've never had any injuries related to this when the quails are the same age, but there is a huge weight difference between the babies and the adults. The other hens usually went around the chicks, but if in a hurry, they just went through. Those babies got squished the same day they were born. We thought that this might be because they still couldn't walk, so if a hen checked the nest, they could have stepped on them, so the second time around, we kept the mother hen with her chicks in a different spot to allow the chicks to grow a bit. For this second batch of quail chicks, we gave the broody quail unfertilized quail eggs (just until we found other eggs), and purchased some eggs that had already been in someone else's incubator for 14 days. We transferred them to our own incubator (we wanted to be sure they would hatch so that she doesn't stay broody for too long - at that point she had already been broody for 24 days). Once hatched, we placed them under her wings, making sure that she didn't see them. This is important, because if she sees them before having felt them under her, she may reject them and peck them, because they aren't her chicks. Make sure to observe her for a while, but we haven't had any rejections with either the quail, or the many chickens we've done this with. After a week, we put them back with the other (they could walk, jump a bit), but unfortunately, they once again got squished with the other adults. This time, the quail did not become broody again, and went back to accepting the male after a few days. If one of our quails becomes broody again, we will wait until the chicks are bigger before mixing them with the other adults. Our broody quail. Can you see the chick poking it’s head through the hen’s wings?